Blue Demons to the UC? It looks as though I stand corrected. DePaul University has switched gears and is now considering moving their men’s basketball home games to the United Center instead of the All State Arena in Rosemont, reported the Chicago Tribune on Monday. 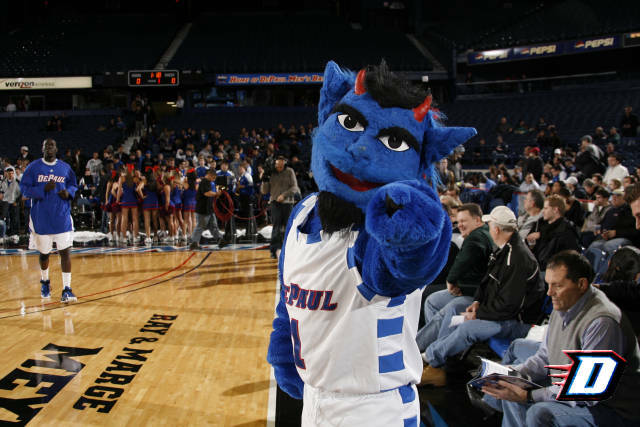 Back in March the reports were saying DePaul president Reverend Dennis Holtschneider wanted to build an arena in Chicago specifically dedicated to the Blue Demons, but now it looks like DePaulians will be sharing a house with the Bulls and Blackhawks. It’s definitely time for a change. The bus ride from Lincoln Park down to Rosemont in weekday rush hour traffic is pee-your-pants kind of tragic. DePaul has played at the arena in Rosemont for the past 30 years – it’s since gone through some name changes Rosemont Horizon and currently the AllState Arena. The United Center is closest to UIC’s campus – definitely not DePaul in Lincoln Park. There isn’t a direct CTA bus/L route from LP to the UC. I’m sure students will get bussed, but driving through city traffic can be just as rough as traffic on the expressway. The United Center is most accessible from the Loop on the lovely express Madison bus. DePaul fans barely filled up the All State – we’re going to look pathetic at the massive UC unless we significantly build up our fan base – maybe get a team with a winning record. Playing at the United Center has a prestigious aura since players like Derrick Rose and Michael Jordan have played/are playing on the very same court. It may very well be an excellent recruiting tool! So all in all, we will see. More to come soon! This entry was posted in NCAA and tagged all state arena, Basketball, Blue Demons, Depaul, DePaul University, united center by Marques Says. Bookmark the permalink. I have been thinking about this for years. It is well known that Chicago is one of the most fertile recruiting grounds for college basketball. We are home to recent and future college superstars (Derrick Rose, Anthony Davis and soon Jabari Parker). How can DePaul start landing some of these recruits? Open up a brand new arena in Lincoln Park (Potential locations Old Children’s Memorial hospital location or by the Vienna Beef factory at Fullerton & Damen). Make a pitch to Nike to turn DePaul basketball into the “Oregon” on the Midwest. Nike can help fund the new stadium and top of the line facilities. Nike can use the team as a marketing machine, outfit them in new gear and shoes and create some type of in-stadium Nike experience. What Chicago High School player is going to turn down world class facilities, get the foot in the door with Nike and become a legend in his own city? Just imagine DePaul fielding an all Chicago team. They would pick up a ton of new fans, as the stadium would be easily accessible. The crowd would be going bananas every home game. This makes too much sense, to not happen.